Research shows sitting too much isn’t healthy and standing all day is challenging, but freely moving between these positions throughout the day is best. 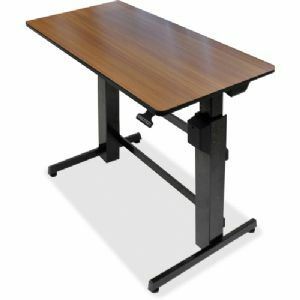 This ergonomic desk with patented Constant Force (CF) technology provides 20" of effortless lift, allowing you to move from a sitting to a standing position whenever you like for prolonged computing in comfort. Safe and easy to use with simple installation and operation. Robust 65-lb. weight capacity; accommodates multiple displays, keyboards, books, phones, etc. Pre-drilled to accept Ergotron® NeoFlex® Underdesk Keyboard Arm; add an Ergotron® LX LCD Arm as needed to accommodate individual workflows. Weight Capacity (text): 65 lbs. Screen Weight (Max): 65 lbs. Worksurface Platform Width: 47 5/8"
Worksurface Platform Depth: 23 1/2"